Although we hardly know what dreams are, and why we dream, we all have them. Some people dream every night and have vivid dream. Other people just remember flashes of their dreams. Sometimes we remember a lot of dreams, and sometimes we remember nothing at all. How is this possible? 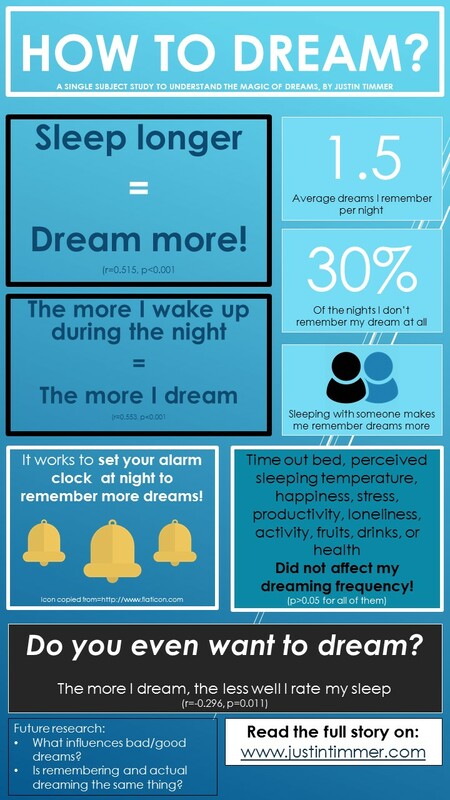 Do we all dream every night about the same amount of dreams or is it different per person? Are some people just good at remembering their dreams or do they just dream more? We might think that important events during the day influence the amount of dreams we have at night, but we are not sure yet. It could also be the case it is something in the night itself that makes us remember our dreams. If you spend more time in specific sleep cycles (like light-sleep) you won’t dream that much but if you spend more time in REM-sleep, you would dream more. Secondly, it could be questioned if we want to dream. Might remembering dreams be an indication of how well you sleep? Have you ever woken up slightly frightened from a scary dream? At those nights you didn’t sleep that well, did you? All together, there are many questions about the strange phenomenon of dreaming. I will try to answer a few of them to get more insight into my own dreaming pattern. I track a lot of things, as I always do. But 73 days ago I also started to track how many dreams I remembered in the morning. Thus, I counted the amount of dreams I remembered. It is quite hard to count the amount of dreams because some dreams seem to merge right into the other dream. However, I tried to measure this as accurate as possible. In 29 night (30%) of the 73 nights I had no dreams at all. In the other nights I have dreams ranging from 1 till 5 dreams. I did correlations between all variables but I also did T-tests (with a no-dream group, and a >1 dream group) to compare the differences. The outcomes were relatively the same. Click on the picture to sharpen the text! There are many enthusiasts of Lucid-dreaming who try to control their dreams by making themselves aware of their dreams. They often keep a dream-diary to make them remember their dream more vividly. In that way their dreams start to feel like reality and eventually they can control their dreams. This was not my goal but it was interesting to see that counting my dreams (and not the context) did not change the amount of dreams I had. This non-effect was important for the quality of the rest of the study. I found a quite strong relation between my sleep length and the amount of dreams (0.515, p<0.001). It seems very simple, the more time you have to sleep, the more you can dream. Not very surprisingly, but I haven’t thought of this relation before. When I sleep with someone, in this dataset it has been only my girlfriend, I remembered more dreams. I had on average 1.73 dreams when we slept together, and 1.12 when I slept alone. What is interesting here, is that I also have a habit of talking in my sleep. A few months ago, I found out with the Sleep as android app (which records audio), that I only talk in my sleep when I sleep together with someone else in the room. When I slept alone I never caught myself taking on tape. It might be that I also do this with dreaming. I might talk and dream more because of the presence of others. All the things that happened the day before didn’t affect my dreaming frequency at night. My perceived happiness, activity, stress, productivity, fruit intake, health, sociality, drinking amounts, had no effects at all on the amount dreams that following night. However, there was one variable: alcohol consumption that made me significantly dream less. However, alcohol consumption also correlates strongly with sleep duration (More alcohol = shorter nights). Thus, it might be that alcohol is just a mediating variable, and not the cause. Overall, the amount of dreams was not affected by the events of the day before, but the content of the dreams might have. I didn’t measure this, but this might be something for future research. It could be assumed that having a cold/or hot nights of sleeping might affect dreaming frequency. Nonetheless, none of those assumptions showed up in my data. This could be caused that I don’t have that much variation in my sleeping temperatures. If the nights are hot, I throw my blankets of, if the nights are cold I pull some extra blankets over my body. A personal RCT-design over time might be more appropriate to understand these effects. While sleeping your brains goes through different sleep phases. These phases are light-, deep-, and REM-sleep. During REM-sleep you dream the most, thus you could assume that if you wake up in REM-sleep you might remember more dreams. So if I would wake up at 6 am I might wake up during the Deep-sleep phase, and at 8 during the Light sleep-phase. However, for me this didn’t seem to be the case. The time I wake up does not affect my amount of dreams remember. The more I wake up during the night, the more I dream. This was the strongest correlation (r=0.553, p<0.001). I think this is the biggest predictor of the amounts of dream I remember. When I wake up in the middle of the night, I remember my dreams vividly, or are still dreaming a little. In the morning after, I still remember these moments and still remember those dreams. To test this, I made a sub-experiment. I set my alarm-clock a few times in the middle of the night to see if I remembered more dreams. And indeed, in the morning after I remembered more dreams. Thus, the more I wake up at night, the more I dream. Waking up at night is a sign for me of a “bad-sleep”. In my perception I sleep well when I close my eyes in the evening and open them again 8 hours later in the morning. I don’t want to wake up in the middle of the night; that’s a bad sleep. Thus, the amount of dreams have a negative relation with my perceived sleep quality. Maybe I don’t want to dream that much then. Dreams were, and still are a big mystery. The secret of the amounts of dreams is kind of unraveled and seem to be caused by the times I wake up at night and my sleep duration. But I don’t want to wake up so much during the night. And this would mean that I want to dream less. A population study also showed this finding: “high dream recallers are more reactive to environmental stimuli [during sleep], awaken more during sleep, and thus better encode dreams in memory than low dream recallers.” And I don’t want to be that reactive to environmental stimuli at night, I just want to sleep. However, a study at Harvard Medical School concluded that dreaming also helps us consolidate memories and retain information. Based on this study by Harvard, the Hufftingon Post concluded that “good” sleep — or sack time that includes REM sleep — leads to an active dream life, and in turn an active dream life is good for us. Well, that is a difficult thing now, because l don’t know if the amount of dreams I remember have any relations with the amount of dreams I really have at night. Unfortunately, I don’t trust my sleepwatches that much to Identify sleep-phases but I might try to analyze the data from my watches later on. That is something for the future. Nonetheless, dreams still have something magical and I am always excited whenever I dreamt something crazy. Not dreaming at all seems like a loss of unbelievable crazy stories that I have been through at night. That is a loss of the pure magic of dreaming. Would I like to sacrifice that? I really admire the lucid-dream experts who go through that crazy stuff every night. But I am afraid to play with sleep that much, I am a good sleeper now, and I don’t want to disturb myself sleeping. What do you want? Do you want to reset and optimize your sleep schedule? Go to Healthambition.com for some insightful tips!